Born at Uxbridge, Ontario on 18 May 1890, he came west in 1899 to Hartney and later homesteaded in the Swan River Valley. In the early days of the First World War, he enlisted in the 44th Battalion, earned a Battlefield Commission, was invalided home after Vimy Ridge and wrote the Unit’s war history, Six Thousand Canadian Men (1932). The book was described in the Canadian Historical Review as surpassing all such chronicles from “the standpoint of pure history, almost a model of critical analysis.” During the Second World War, he served with the Winnipeg Grenadiers (Reserve) and retired as Officer Commanding in 1947. 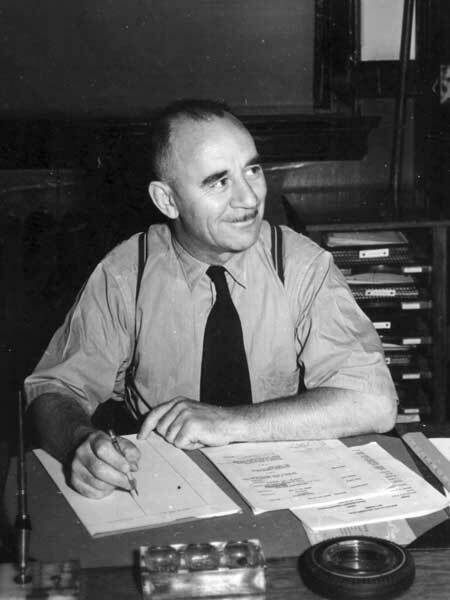 Ed worked with Winnipeg Hydro and Manitoba Hydro, the Canadian Conservation Institute, Ducks Unlimited, and the Canadian Wheat Pool, before retiring to “Happy Acres” near Headingley in 1958, where he became active in community affairs and were staunch members of Headingley United Church. Ed continued, as he had for half a century, to research Canadian history and to write, broadcast and speak out on the need for conservation and management of Canada’s vast natural resources. As CBWT television’s first weatherman, his “Ah, yes, the heart of the continent” was a daily reminder of how he felt about his community. He later used The Heart of the Continent as the title of his published 1968 project, a history of Assiniboia. He also wrote histories of the Wawanesa Mutual Insurance Company and Winnipeg Hydro. His Meri-Ka-Chak - His Message and Follow the Trail for children were immediate successes and fifty-thousand copies were sold in nineteen countries. He was a Liberal candidate for the Winnipeg South Centre constituency in the 1962 federal general election but was defeated by incumbent Gordon Churchill. He was married twice, first on 4 December 1917 to Ethel Thompson Kennedy (1895-1928), and second on 1 July 1931 to Kathleen J. Vanstone. He had three children. He was a charter member of the Manitoba Institute of Agrologists, First President of the Historical Museum Association of St. James-Assiniboia, founding board member of the Manitoba Centennial Corporation (1963), Citizen of the Year in St. James in 1970, and Honorary Life Member of the St. James Chamber of Commerce. He won a Golden Boy Award, the Pioneer Historian Award of the Red River Valley Historical Association, a Manitoba Centennial Medal from the Manitoba Historical Society (1970), the Bern Lowe Memorial Award from the Winnipeg Chapter of the Meteorological Society of Canada, and was inducted into the Manitoba Order of the Buffalo Hunt (1981). He spearheaded such community projects as the development of the Omand’s Creek Recreation Area, Grant’s Old Mill, and the St. James Assiniboia Museum. He also served with much pride and dedication as a member of the Historic Sites and Monuments Board of Canada and the Historic Sites Advisory Board of Manitoba. Ed was both interesting and interested, a man who loved life, his country and his family, who took time to help others and to be a true friend. His unique story telling talent moved listeners to both laughter and tears. He died at the Deer Lodge Centre on 3 February 1991 and was buried in the Chapel Lawn Memorial Gardens. His papers are at the Archives of Manitoba. “‘Heart of the continent’ loses grandfather,” Winnipeg Free Press, 5 February 1991, page 3. Obituary, Winnipeg Free Press, 5 February 1991, page 31.